GALATIANS 3:26 KJV "For ye are all the children of God by faith in Christ Jesus." 23But before faith came, we were kept under the law, shut up unto the faith which should afterwards be revealed. 24Wherefore the law was our schoolmaster to bring us unto Christ, that we might be justified by faith. 25But after that faith is come, we are no longer under a schoolmaster. 26For ye are all the children of God by faith in Christ Jesus. 27For as many of you as have been baptized into Christ have put on Christ. 28There is neither Jew nor Greek, there is neither bond nor free, there is neither male nor female: for ye are all one in Christ Jesus. 29And if ye be Christ's, then are ye Abraham's seed, and heirs according to the promise. 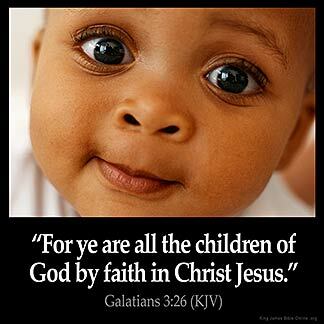 For ye are all the children of God by faith in Christ Iesus. Because you are all sons of God through faith in Christ Jesus. For alle ye ben the children of God thoruy the bileue of Jhesu Crist. 3:26 For ye - Christians. Are all adult sons of God - And so need a schoolmaster no longer. Ga 3:26 For ye are all the children of God by faith in Christ Jesus. Faith has come to all of you. You are all God's children by faith in Christ. Hence you are under the schoolmaster no longer. I praise God that I am a child of the King. By faith in Christ Jesus I am. I Thank God for the gift of Faith. I Praise God that I have been made alive in my Lord Jesus Christ through new birth. I know that I am born again because I believe He is in me. I feel Him in me . He and I talk with each other. OH !! Praise God !! !